The program offers a tabbed, multiple document interface with window splitting and spell checking, plus find and replace and case conversion. Although it lacks some of the smartypants features seen in fully featured writing programs like Word (there’s no grammar checker to be seen, for example), we found the lack of distracting glitz and gizmos helped us concentrate on the writing. 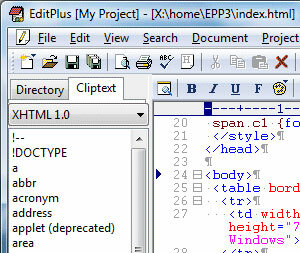 A HTML editor toolbar gives quick access to a string of HTML tags with a built in browser letting you quickly preview web pages. Other features related include FTP commands for uploading local files to FTP server, line number, ruler, URL highlighting, auto-completion, cliptext, column selection, powerful search and replace, multiple undo/redo and customisable keyboard shortcuts. The interface is, as you might expect, nothing much to get excited about, although it’s unobtrusive enough in a ‘spirit of Windows 98’ sort of way and can be customised to within an inch of its life. 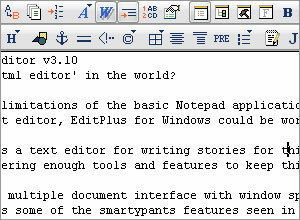 Now over ten years old, EditPlus hails from South Korea and remains supported by a fairly active user community who have contributed their own syntax libraries for free distribution. 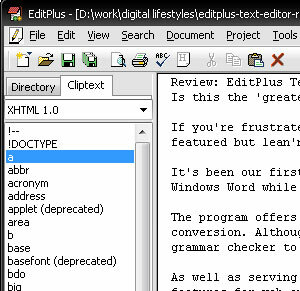 We’ve been fans of this program for several years now, and use it for both writing and quick HTML/ programming edits. We find it fast, simple and intuitive to use and pretty much an essential app on our PC. That said, the price tag is more than a little steep at $35, especially when compared to Notepad++ which offers most of the same features for absolutely nothing. However, if you’re looking for an extremely powerful, hugely configurable editor in a streamlined, no-guff package (the program only weighs 1MB), then we recommend downloading the trial version and giving it a go. It’s a bit pricey, but it is a bit good too.